On the occasions when I sat under the mango tree in Joetown, Sierra Leone, the trappings of Western living were very, very far from my mind. Blog? It sounds like something you are trying to say while experiencing a nasty head cold. It certainly was not something to give much consideration to. Other things were much more important such as how could I discreetly manage to slip off to the water pump to wash my clothes without someone shouting, ‘I’ll do that for you Granma!’ But as the days slid by, Granma was allowed to ‘board’ (wash) her clothes, help with housework, clean out red dusty resource rooms and carry heavy bags. The only thing I was not allowed to do was take a ride on a ‘moto’ to the nearby town to explore the bazaar. Not safe, I was told. Never at any point did I think, ‘What am I doing here?’ One look at me establishes the fact I am no spring chicken. The name ‘Granma’ was automatically used by most people; the officials at Lungi airport, the ferry terminal operators, the children at Heaven Homes, the school and the villages where I went to explore just a little further. It was not a cheeky and dismissive term but more of a caring and respectful nature. From reading the application to join a global expedition team run by Operation Orphan to Heaven Homes in Sierra Leone, rural West Africa, to the day I drove back home to the quiet glen in the North West Highlands of Scotland was a long journey. Obstacles presented themselves along the way and were considered, dealt with and dismissed in a summary manner. Perhaps the most ridiculous situation was at the clinic on the East Coast of Scotland where I had to go for the yellow fever vaccination. ‘I have to tell you,’ said the nurse, ‘that people of your age can have a very nasty reaction to this vaccine and might require hospitalisation and perhaps it might even be fatal.’ She paused and eyeballed me asking, ‘What shall I do?’ I shrugged my shoulders in true Scottish fashion and replied, ‘I have paid for the journey and the vaccine, there is no refund, give me the jab.’ Happily I experienced no side effects. We then went on to the malaria pills. The only type suitable for me was one which could induce crazy, vivid dreams but I slept like a baby on a mattress on the floor under a mosquito net for the duration of my stay. I really do not think that a short blog could do justice to the trip: so much to absorb, so much to learn. I was there to offer some teacher training workshops but in reality it was one huge workshop, from dawn to dusk, where I was the learner. It would be so easy to romanticise the trip: the smiling children, the rich voices, the genuine friendship, the handsome, beautiful people, the scent of lemongrass, the refreshing taste of a mango shaken from the tree, the novelty of the cuisine and fascinating outside cooking style but that would not do the trip justice. It was so much more and even that ‘more’ was but a glimpse into a very different culture, different values, a history calling to be studied and a feeling of bewilderment for a country that has been bruised and battered by civil war and a deadly epidemic. I am at home now. 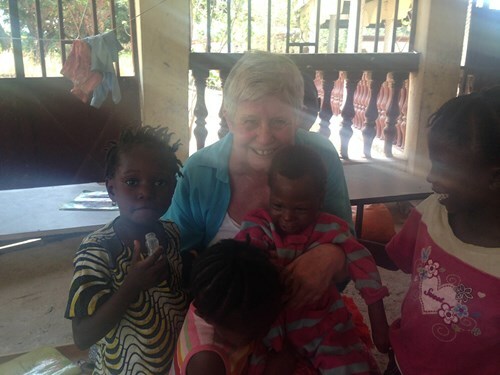 I have not left a part of me in Sierra Leone. Here at home the tops of the mountains are white with snow, the glen is quiet, the sheep are waiting for their young to be born, the river flows endlessly into the sea-loch. Nothing has changed except that I feel the presence of the people I met in Sierra Leone here with me in this glen. I will apply to go back next year with Operation Orphan. Perhaps even arrive in style… on a moto. My journey has not ended . It has barely begun.